By: Karen Morrison on Oct 25, 2007, 12:07. Allure Backstage Spring 2008 hair trends – Messy Updos. Proof that updos don’t have to be uptight: check out this season’s easy, undone buns. This season at show after show hair stylists loosened up the texture and gave the hair a more wispy quality. As Eugene Souleiman explained his idea for the hair at Dolce & Gabbana was in complete contrast to the makeup, “its something much much softer, drier, more sensual. It’s not a bun, it’s not a structured bun”. What is great about this messy undo is you can do it, it does not take a lot of work. It actually uses the imperfection that most people have and takes that to its advantage as Eugene Souleiman confessed to us “there is absolutely no technique to this what so ever”. The hair at Giambattista Valli was completely gorgeous – one of the best looks of the Spring 2008 season. Orlando Pita was the hair stylist at the show and explains that because of the volume in the clothes they wanted to do something up – “I try to let my hairdos, even like here be a little on the simple side and a little bit undone so it looks more like today”. Executive Producer & Director, and Interviews by Karen Morrison, DP Cameraman: Sebastien Goyer, Soundman; Giovanni Sicignano. Camera Karen Morrison. 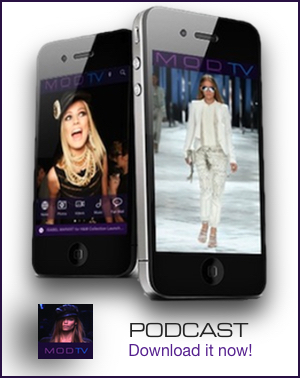 A production of MODTV Fashion Network.